Slightly smaller than the Gothic, the Harrogate Bower has become very popular for the smaller garden. Having a flat back makes it perfect to sit against the garden boundary or close to a building or wall. Ideal as a focus point or as a place to relax and enjoy your garden in all its glory. The Classic models will take a two seater bench whilst the Classic Extra model will comfortably fit a three seater garden bench. Metal formed lattice infill panels are available for the Harrogate to support your climbing plants, adding form to the structure in the first season before the climbing plants begin to get established. 15 year Guarantee. Sizes available: 1.5m (5') Width x 2.2m (7'2") Height x 1m (3'3") Depth. Slightly smaller than the Gothic, the Harrogate Bower has become very popular for the smaller garden. Having a flat back makes it perfect to sit against the garden boundary or close to a building or wall. Ideal as a focus point or as a place to relax and enjoy your garden in all its glory. The Classic models will take a two seater bench whilst the Classic Extra model will comfortably fit a three seater garden bench. 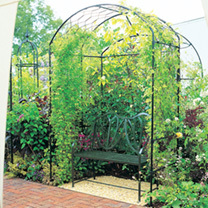 Metal formed lattice infill panels are available for the Harrogate to support your climbing plants, adding form to the structure in the first season before the climbing plants begin to get established. 15 year Guarantee. Sizes available: 1.5m (5') Width x 2.2m (7'2") Height x 1m (3'3") Depth & 1.8m (6') Width x 2.2m (7'2") Height x 1m (3'3") Depth.